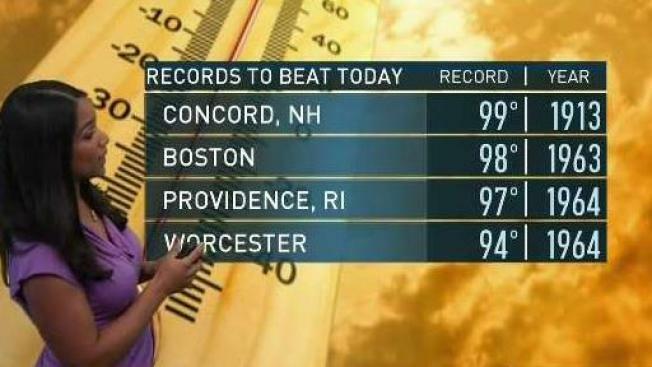 It’s official - Boston’s first heat wave of the year was set today with its third consecutive day of highs in the 90s. The city hit 90 on Friday and 92 on Saturday and right before 10 a.m. on Sunday, Logan airport made it to to 90 degrees as well. Heat indices may exceed 105 degrees through the afternoon, especially west of 128. An Excessive Heat Warning means conditions are dangerous to be doing anything strenuous outdoors. This weather has many enjoying the summer heat, especially because it is a holiday week. The heat extends inland where excessive heat warnings and heat advisories are in effect as heat index values will surpass the century mark. Dew points are in the mid-60s to low 70s, creating a very humid air mass. Towns in the Connecticut Valley, will be sizzling under the hot sun and high humidity as “feels-like” temperatures will range from 105- to 110-degrees. It’s dangerously hot outside so make sure to stay hydrated and give yourself breaks if outdoors. Check on your neighbors and bring your pets indoors if possible. At night, the humid air sticks around so we won’t be getting a break at all. Lows will drop into the 70s. The dome of high pressure, responsible for this heat, will control our weather pattern until Wednesday, Independence Day, that’s when we will begin to see changes in the afternoon with isolated showers and storms. Right now, we are not forecasting a washout for the fireworks display, though pop up showers are possible right before 10pm. By Friday, a cold front will approach the area, bringing much needed rain to New England being that we continue to be under abnormally dry conditions - running close to an inch below normal at Logan Airport. Behind the front, temperatures will also take a plunge and our highs next weekend will be in the 80s, a lot closer to average.